With Thanksgiving being so late this year it is hard to believe it’s already December! Luckily, Russell and I started our Christmas shopping a couple months ago and I ordered our Christmas cards on Monday. We also put up our Christmas tree earlier this week so I don’t feel too far behind, but I know Christmas will be here before I know it! I’m so excited to be living in Alabama this year. It’s such a wonderful feeling knowing that we won’t have to travel during the holidays. 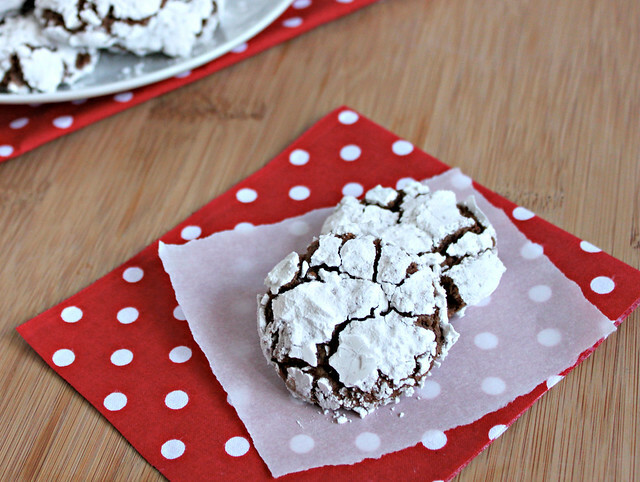 I actually made these cookies last year for a cookie swap, but I will definitely be making them again this year! I needed 6 dozen cookies for the cookie swap so I doubled the recipe and used a small cookie scoop for this batch. In a medium bowl, whisk together flour, cocoa powder, baking powder, and salt until well combined. In a large bowl, beat the butter and sugar together on medium speed for about 3 minutes until nice and creamy. Add 1 egg and beat on medium speed until well combined. Add the second egg and vanilla extract. Beat on medium speed again until well combined. Add the flour mixture to the butter mixture and beat on low until just combined. Using a tablespoon cookie scoop (can use smaller cookie scoop, just decrease baking time by a few minutes), scoop up a ball of dough. Roll dough in your hands to create a ball. 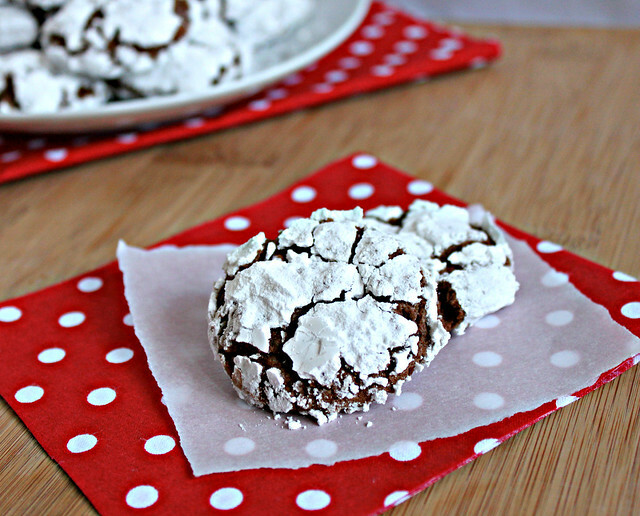 Roll the dough in the powdered sugar until completely covered and place on the cookie sheet. Repeat with the remaining dough, placing the balls 2 inches apart. Bake for 10-12 minutes or until they are cracked and puffed. Remove cookie sheet from the oven and allow to cool on a wire rack for 15 minutes before moving the cookies to a wire rack to cool completely.